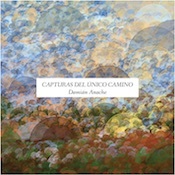 Personally, I haven’t the patience for the style of composer Damián Anache as it is presented on Capturas del Único Camino. Extremely sparse in its construction and perhaps a bit overly dedicated to the compositional importance of silence, the release presents four mid-length pieces arranged in part through an algorithm that pulls sound samples together. Slowly. And randomly. The sound-set is deep and varied, from running water to vocal samples to string instruments and glockenspiel, but it’s like they’ve been precariously balanced on a beam over our heads and we’re supposed to be interested in how and when they happen to fall. And the last track is 14 minutes of the sound of a stream, which is processed in spots and sometimes drops out entirely. Of the four tracks, the only one that hold my attention for any length of time is “Pasaje Propio,” which builds off of Anache’s voice and turns it into a chant-like ritual. Even at that, the voice bits enter, rise, fall and then do it again. There may be something here for listeners into higher-math music. The generative properties of the music and the way the Ambisonics program constructs them, might lend it an intellectual appeal. It’s not for me.